MONTREAL – Montreal Canadiens general manager Marc Bergevin announced Tuesday that the team has agreed to terms on a three-year contract extension with forward Paul Byron (2016-17 to 2018-19). “We are pleased to have reached an agreement with Paul Byron. A fast-skating and versatile forward Paul has been an important addition to our team. He can contribute on the offensive side while being responsible defensively. Furthermore, he demonstrates an exemplary attitude and the qualities of a true professional. We’re proud to have him among our group of forwards for the next three seasons,” said general manager Marc Bergevin. Byron, 26, played 40 games with the Canadiens thus far this season, harvesting 11 points (8 goals, 3 assists) and four penalty minutes, while playing an average of 13:11 per game. Byron leads the team in goals (3 – tied for third in the league) and points (5 – tied for second in the NHL) while shorthanded. Since making his NHL debut with the Buffalo Sabres in 2010-11, Byron has collected 59 points (25 goals, 34 assists) in 178 games with Buffalo, Calgary and Montreal. The 5’08’’, 158-lbs forward has served 45 penalty minutes displaying a +3 differential. Three of his goals were scored on the powerplay, four on the penalty kill and he added three winning goals. A native of Ottawa, Byron was drafted by the Sabres in the sixth round, 179th overall at the 2007 NHL Entry Draft. 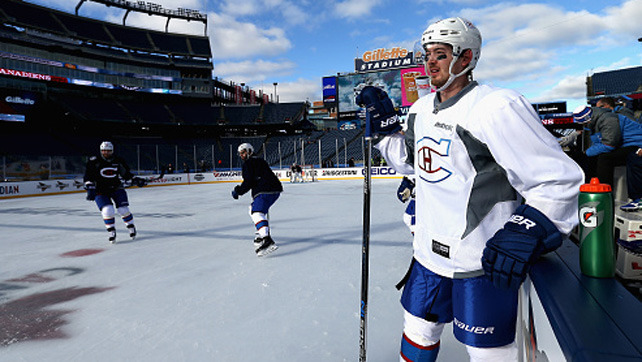 The Canadiens claimed him off waivers from the Flames on October 6, 2015.